Clomiphine citrate has been used for ovulation induction for many years. It acts by functioning as an antiestrogen, blocking the normal feedback response between the ovary and the hypothalmic pituitary axis. 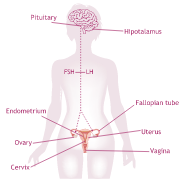 By blocking the estrogen receptor the pituitary gland receives less estrogen being present and releases an increased amount of FSH to stimulate the ovary. This results in the recruitment and continued development of an oocyte and eventual ovulation. The antiestrogenic effect of Clomiphine can also affect the priming effect of estrogen on the endometrial lining as well as the production of cervical mucous. The ultimate effect on these target organs is usually a balance between the increased estrogen produced as a result of ovarian stimulation and the antiestrogenic effect of the Clomiphine. Clomiphine Citrate is indicated for the treatment of ovarian dysfunction. This includes patients with anovulation, oligo-ovulation, luteal phase defect and those requiring timing of inseminations for the treatment of male factor or donor inseminations. Clomiphine Citrate is usually commenced between the 3rd and 5th day of the menstrual cycle, counting the first day of full flow as day 1. The medication is usually taken in the evening, in tablet form, for 5 days. Most patients respond to either 1 or 2 tablets daily (50-100mgs). Occasionally dosages of up to 250 mgs are required to achieve ovulation. The response to Clomiphine therapy should be monitored to insure that an appropriate effect is being achieved. Normally, it is our practice to startClomiphine Citrate between cycle days 3-5 with the patient using an LH kit from cycle day 12. 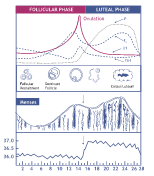 An ultrasound and serum estradiol is often obtained on cycle day 14 and if an adequate dominate follicle exists in the presence of an adequate estradiol level and a good biological effect on the endometrial lining, hCG is administrated intramuscularly. The latter agent substitute for the body’s natural LH surge. Most commonly, ovulation will occur in 30-50 hours following this injection. The multiple birth rate with Clomiphine Citrate is estimated between 6-8%. The majority of these multiple gestations are twins. Other side effects such as moodiness, hot flashes, headaches, and blurred vision have been described. Does Clomiphine Citrate increase risks of birth defects? According to the American Society for Reproductive Medicine, doctors can advise patients that ovulation induction agents are not associated with an increased risk of birth defects. induction agents discuss the potential benefits and risks with the Doctor. It is the Center’s feeling that all fertility drugs need to be used prudently with suitable monitoring for a limited period of time. Most commonly an endometrial biopsy is considered a diagnostic evaluation. Our administrative staff will be happy to assist you in evaluate your coverage and patient responsibility. We strongly recommend you to call your insurance company to find out about benefits of your policy.